Visitors often find Miami Beach Parking more difficult and more complicated than they anticipate. Luckily, there are many parking garages located within walking distance of nearby attractions which can be used by visitors, check out the map or list below. Municipal lots do not allow overnight parking. 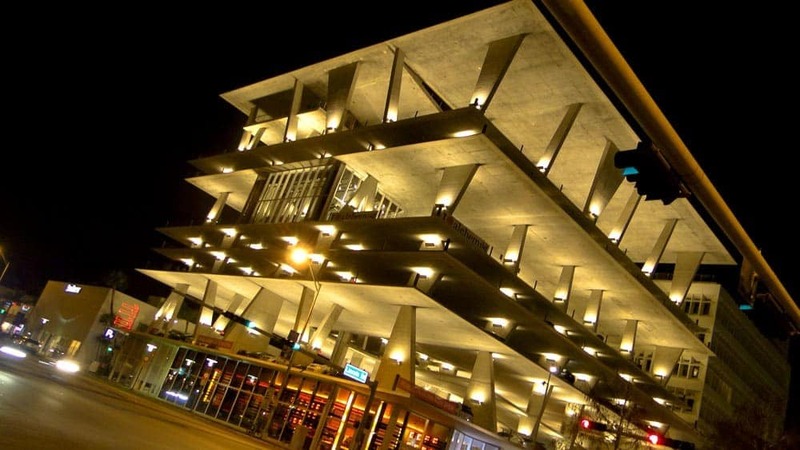 For the architecture fans should be sure to check out 1111 Lincoln Road which is pictured above, the upper floors are all parking decks and offer some of the best views in Miami. Be aware that parking here is expensive $30 per hour. Metered on the street parking is $4 per hour, metered off the street parking is $2 per hour. Metered parking on the street from 22nd to 44th Street is $3 per hour, metered off the street parking is $2 per hour. Metered parking on the street above 44th Street is $2 per hour, metered off the street parking is $1 per hour. Miami Beach has made it easy to pay for your parking, the Maimi Beach ParkMobile App enables you to pay directly from your phone. More information and links to downloads can be found on the City Of Miami Beach Parking Page. Depending on the violation a parking ticket in Miami Beach runs from $18 to $28, this is almost always cheaper than paying to park in a commercial lot. Sometimes it’s worth the risk. Don’t park in a handicapped spot without a permit, that will set you back $153.